After three nights of escalating energy, the audience inside MSG was literally buzzing with anticipation for the final installment of Phish's 2013 New Year's run. Walking out to thunderous applause, the band members took their positions and ripped into "AC/DC Bag." The fairly standard version unraveled at its end, and the boys plunged into "A Song I Heard the Ocean Sing." The first Undermind track of the run, Trey opened it up a little with some shimmery licks. Then those whose mouths had been watering since Saturday's fakeout finally got their "Wilson." Page's gurgling organ was the high point of "The Divided Sky," but the mid-song pause went on a little too long and damaged the flow. Towards the end, Trey was visibly laughing at some of his flubs. They followed with "Ocelot," letting it breathe a little to nice results. They took longer than normal to figure out what would be next, and "Sugar Shack," with some notably warbling vocals from Gordon, was not the best choice. It was chased with the piano-based "Halfway to the Moon." I'd never heard the song before, and judging from the tepid crowd response, neither had most of the audience. Everyone, however, knew the song that came next: "Fluffhead." It wasn't exactly a saving grace; more of a pretty ribbon to wrap up the weakest set of the run. But as was evident the previous night, it's not about the first set. The band carried a keyboard onto the stage as an homage to the photo on the cover of Colorado '88. "We made everyone a cake," announced Trey as he began divvying up the 30th birthday treat. "We're gonna hand out some cake for the set break." They passed out maybe three pieces, and left the stage. Did anyone get a slice? How did it taste? The time to get a beer to wash it down wasn't yet. The screen on the new scoreboard flickered, and a video began. Dilapidated remnants of past New Year's gags were all collected in a rural junkyard. Set to a "2001" jam, a bearded Fishman resurrected a box truck from the ruins, and started driving it south. Aside from one major accident that scarred the truck's roof, he eventually made it to New York City and up the halls of MSG until the physical truck pulled into the corner of the arena. As the truck made its way to the center of the floor, tunes from 1983 like "Let's Dance," "Rockit," and "Rock the Casbah" played out over the PA. It was amusing to hear what the musical climate was like at the time of Phish's inception. The band climbed out of the hatch in the truck's cab, and took their places on their new, much smaller stage. With hockey sticks serving as mic stands and Page sitting on a cushion atop two milk crates, this was going to be interesting. They began with "Glide," last played at MSG on 12.28.11, the only show I missed that run. The rumble of Fish's opening salvo to "Llama" was met with cheers, and then they delved even further into Gamehendge with "Colonel Forbin's Ascent." The mere mention of Icculus' name in "Forbin's" elicited a roar from the phans, so you can only imagine how nuts they went for the actual "Icculus." Anastasio was convinced that some in the masses of people surrounding him were not getting the message, so he recommended that they read the Helping Friendly Book ("You can't get it at Barnes & Noble's"). Trey admitted at its end, "We used to play that song every Sunday, Monday, and Tuesday down at Nectar's in our little hometown, and I did not think, 'Hey, someday I'll be playing that at Madison Square Garden.'" "I actually thought that we'd be playing it right here, tonight, thirty years later. I had a premonition," jested Page. Having barely spoken to the crowd in the last three days, it was great to finally hear them engaging on this level. While I completely understand why this set was so significant for the long-time diehards, I started listening to Phish when Farmhouse came out in 2000. Aside from the jaunty calypso of "The Lizards," I found a lot of their early work to be too proggy. That's not to say I didn't enjoy it. Quite the contrary, it made me want to hear some of the songs I was more familiar with performed in this stripped down setup. "Reba" with its sweet jazz jam and "Split Open & Melt" were my favorites of the bunch, if only because I knew them better. They climbed down off the truck, which backed out of the building during the final set break. With just eight minutes to go before midnight, the band returned with a joyous "Character Zero." The Madison Square Garden and Chase logos may have been glowing proprietarily at the top of the scoreboard the whole night, but make no mistake, at that moment, Phish owned that arena. The countdown on the screen began at 30 (obviously), with the crowd counting down from ten. As 2014 hit, balloons and confetti drenched the room, with Phish shifting into "Auld Lang Syne," the first and only cover of the entire run. They transitioned into "Fuego" as roadies furiously used razors to pop balloons and leafblowers to clear pedalboards. Anastasio forced the segue into "Light," but that became a distant memory once the song went off on a funky tangent that quickly smoothed out into a melodic summery groove. 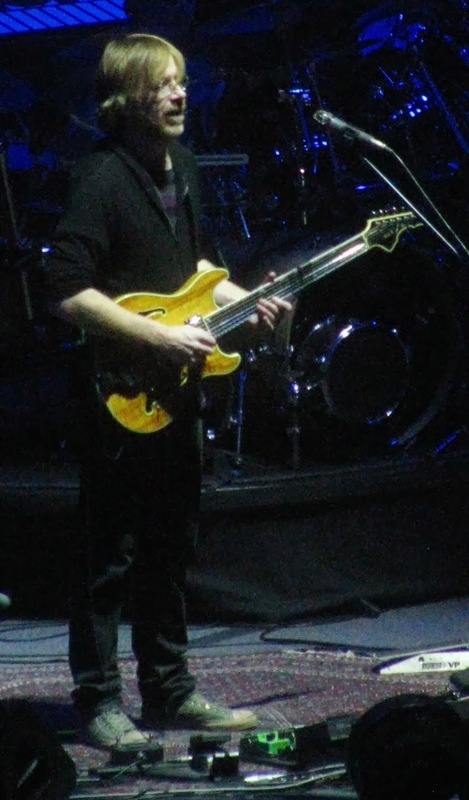 His lighting options limited during the truck set, Chris Kuroda unleashed a rainbow of effects from his arsenal as the jam morphed again into a propulsive rock beat. By the time it reached its dolphins-in-space resolution, the crowd was squealing with approval. "Twenty Years Later" was a little choppy at the start, but it recovered with a balls-out, rocking finish. A nicely layered "Bouncing Around the Room" rounded out the six-song continuous part of the set. What now? A little "YEMSG" anyone? Maybe Michael Gordon should pronounce the G in his name differently 'cause he slam-dunked this one. And they all nailed the a cappella finale. For the encore, the fellas gathered around to sing "Grind," though Trey made a slight modification: "When I come here for my 60th anniversary with these guys, thirty years from now, we'll have lived for..." with each adding an extra 10,957 days to their ages. Adorable. They picked up their instruments and capped off the run with "Show of Life." A "Save the Date" for their 60th anniversary on December 31, 2044, complete with a Photoshopped pic of the guys in their 80s, appeared on the scoreboard. Even though the Garden likely won't be there then, I can't wait 30 more years to see them. Looks like I'm gonna have to go to an outdoor concert.